What is a recipe, anyway? 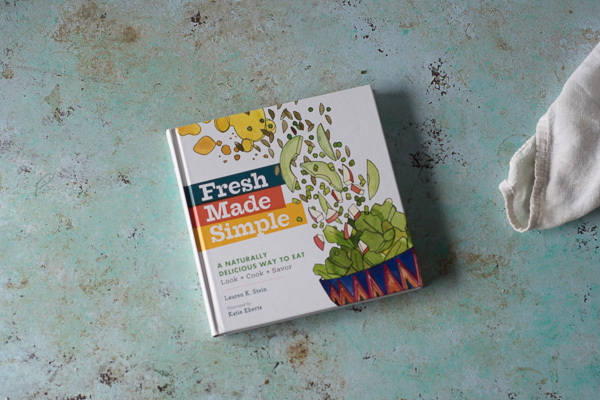 When Lauren Stein contacted me and asked if I wanted a copy of her new book, Fresh Made Simple, I immediately said yes. I knew it featured simple recipes made from real food, which is how I cook on an average day, but I didn’t know the form that these recipes would take. 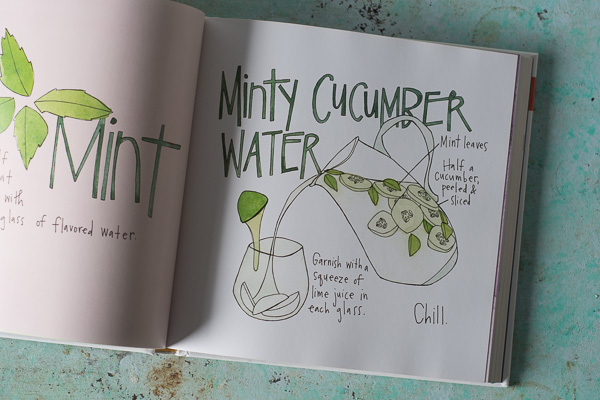 It’s a book of illustrated recipes that provide instruction with minimal text. As I flipped through the pages and tried to think about how to review this charming and unconventional book, I found myself asking, what is a recipe, anyway? The standard format: a list of ingredients with standardized measurements followed by a written set of detailed instructions is a fairly recent invention. Humans have been cooking for thousands of years, but this recipe format only emerged in 1896 in the Fannie Farmer Cookbook. Before that most cookbooks were simply lists of ingredients, without amounts or instructions. In the 18th and 19th centuries, these lists of ingredients were generally known as receipts. The expectation, it seems, is that any cook would have the knowledge to make sense of such a thing or would learn the method firsthand from someone with that knowledge. Or rather, people didn’t learn how to cook from a book or receipt. Now we generally expect recipes to do more of the heavy lifting when it comes to the transmission of knowledge. But exactly how much detail should be included in a recipe is a question recipe writers grapple with all the time. 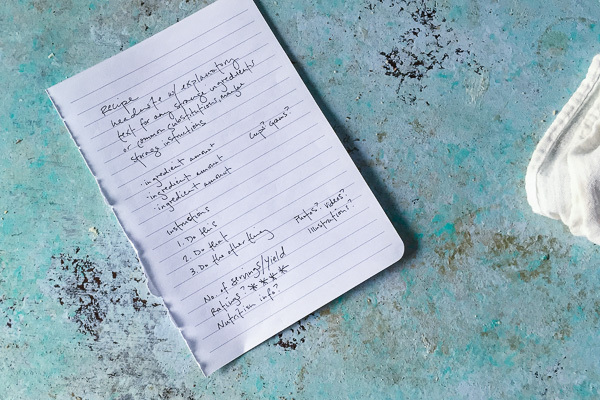 While in school I was a minimalist note-taker (I always cringed when someone asked to borrow my notes, knowing they’d be completely useless to anyone without the quirks of my particular brain) I tend to err on the side of over-explanation when it comes to recipe writing. I attempt to anticipate questions and outline simple procedures because I don’t want to assume that my readers are necessarily as geekily into food as I am. I want to walk people through the details because I want you to feel confident that you can make anything here if you’ve a mind to. But recently, there’s been a bit of a backlash against the standard recipe format. Last March, Food52 launched an app called (Not)Recipes intended to allow users to share casual, everyday cooking without recipes. The New York Times has taken to publishing “no recipe recipes” or what Sam Sifton call narrative recipes or narrative suggestions. 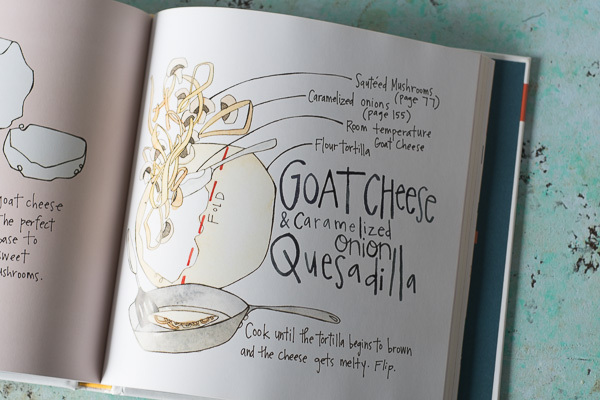 And comic-book style cookbooks with illustrated instructions have become a trend. Eater executive editor, Helen Rosner, has pushed back against the “not a recipe” label, suggesting that all of these minimalist, informal, narrative instructions for cooking are really recipes. And I tend to agree with her. So what is a recipe, anyway? No matter how many people tell me that avocado toast isn’t a recipe, I’ll argue that anything that tells you how to cook or prepare a dish, however simple or complex, is a recipe. Even if Google will only recognize something as a recipe when it includes JSON-LD markup, a list of ingredients, a numbered list of instructions, and preferably a photograph of the finished dish, aggregate ratings, prep time, cook time, and nutrition information. SEO means that most recipes on the internet will be buried deep in search results, and means that superlatives like “the best” will be thrown around to increase the chances that they’ll be found or clicked. But recipes are more than a set of instructions. They’re a reflection of tastes, of what ingredients are available in a given time and place, of dietary trends, of the kinds of appliances and equipment available in home kitchens, of the ways we shop and the ways we aspire to eat. They’re culturally rich historical documents and they’re humble pieces of technical writing that are almost always going to be idiosyncratically interpreted by the end user. Sometimes, I worry that my longer recipes are unnecessarily intimidating. And when I look at the simplicity of these one-page visual recipes in Fresh Made Simple, I appreciate how much information can be conveyed in a glance. I appreciate how the format feels fresh and Katie Eberts’s illustrations feel bright and friendly. 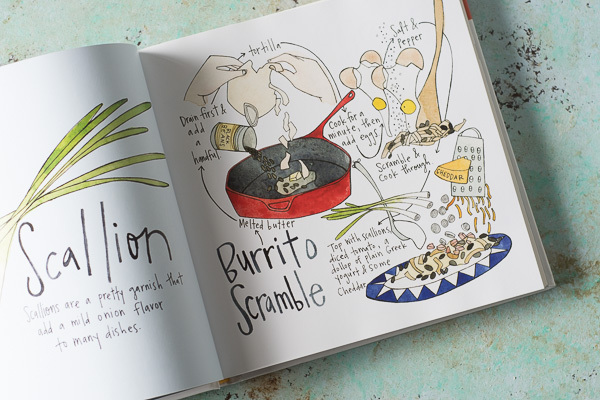 I could imagine a child still learning to read poring over these pictures, delighting in their playful details, and soaking in many of the simple processes of making a meal. These aren’t the sort of recipes that are going to set the world on fire. They are, as the title says, simple, and advanced cooks may be charmed and inspired by the form but are unlikely to learn new techniques. It’s a book for people–especially families with young children–looking to get dinner made with vegetables and minimally processed ingredients on the table on a regular basis. Which, really, let’s be honest is no small feat. This looks like a very interesting and entertaining book, especially for beginners! I would love to have one, even tho I’ve been cooking for years. It’s really a charming book, and even if you know how to cook, there’s plenty of inspiration to be found in it! I have to agree with you Mary..Anything that tells you how to prepare something no matter how simple is a recipe. Not everyone knows how to prepare certain things and they tend to sometimes like the simple recipes best. I tend to find my simplest recipes are my most popular! It’s important not to dismiss simple! This was very interesting. I have grown up with the standard format, to this comic book style is foreign. I’m afraid it is something I would have to really sit down with to evaluate. I do really like real photos of the finished products and photos or notes about uncommon ingredients or techniques. That said, the fewer ingredients, the better. This book could be very beneficial to people (and children) who are new to cooking. It’s certainly a change, and I’m used to the standard format myself, but this made me really think about what we expect when we approach a recipe. I totally get that some people are more word people, some might want photographs, and some might really respond to playful illustrations. You had me at simple recipes and real food! This book looks fantastic. Thanks, Kristine! So many of us are looking for more inspiration at the intersection of simple + real food. I really enjoyed your thoughtful post about ‘recipe’. When I started my blog I struggled with the idea of having to provide amounts. My general style is to make ‘something from nothing’. Simply seeing what I have and creating a delicious dish never measuring, just sensing what would work. Your piece and Stein’s cookbook thas inspired me to find a unique way to provide a ‘recipe’ in my own style. Great blog post. Thanks for making me think. Thanks, Dana! I, too, often cook by feel without measuring, and I think lots of people cook that way on a day-to-day basis. Of course, being able to sense how much is enough requires some experience. I think some people prefer the highly tested and strict measurements and detailed instructions in the Cooks Illustrated style–the benefit of which is if you follow the recipe you know it will work—and some people like more of a handful of this and maybe a pinch of that–which can involve some trial and error. I think as a recipe creator, it’s important to be true to your own voice and your own style! I’m all for creative modes of teaching and expression! Sometimes all you need is a nudge in the right direction. Most of us can cook better than we think we can. That’s true! It doesn’t need to be difficult!